It is no secret that buying text books for your college courses can really drain your bank account. College book stores boast being the only place you can find the book you need at such a discounted price. Do not believe this! Your college’s book store is not a bad place to pick up a book, but you do have other options. Here are just a few other places to start looking for books before you give in to the book store. Buy your books off resale stores online. They usually list the books at different prices, depending on the condition of the book. Personally, I have found buying the cheaper, not as pretty, books work just as well as the brand spanking new ones. Sites like Chegg.com are great sources for books. Make friends who have been going to your college. Find people who are studying what you are studying and make a deal. Work your schedules so that you are both taking classes that the other will need, but take them at different times. That way you can split the cost of the books and share them. It’s a simple and easy way to cut your book budget in half. Some classes barely use the books that they say are required. The library will almost always have copies of these books as well. Email, call, or speak with your teacher and ask how necessary the book is to your success in the class. Most teachers want you to get through college with as little financial expense as possible. But be warned; check the author of the book before you ask your teacher. There is a good chance that the teacher is also the author. Do not ask them how important the book is if they are the one who put the time into writing it. You will not be one of their favorites. Not only do these eReaders help keep your book bag light, they save you money. Purchasing your books on one of these is a great way to save some money. However, some students find it easier to use a classic, paperback book so that they can highlight and take notes. You, also, cannot sell back books purchased through eReaders. These are a great option for saving money, but may not be beneficial for all students. Spending hundreds of dollars in the book store does not have to be your fate! Be on the lookout for places to buy your books for cheap or for options to split the price in half. And do not forget to sell back your books at the end of the semester. If the book store will not buy back the book, sell it online! If you are willing to look for them, there will always be ways to make or save money on your college text books. The process of filing for taxes is one considered tedious and somewhat inconvenient. As such, the opportunity to do it remotely is a welcome one for most individuals and businesses. It is with this in mind the Internal Revenue Service provides an opportunity for one to file their taxes electronically. There also other avenues to do this that are affiliated with the Internal Revenue Service. The advantages, apart from convenience, are two other important aspects: the filing process safe, and free. There are also significant reductions in the time that one needs to wait for a tax refund, with the period being cut in half in some cases. Another often quoted advantage is that if you have arrears or back payments owed to the Internal Revenue Service, the electronic filing process provides you with more options through which you can remedy this problem. Within the Internal Revenue Service, the process is of filing taxes called the IRS e-file. It has been available since 1990. The option that is provides for one to file their tax returns freely is called Free File. Free File is open to individuals with an annual income below $57,000 and there are a number of ways a person interested in this facility can access it only through the Internal Revenue Service website, www.irs.gov. For those wishing to file for their taxes electronically that are open to any income bracket, one can use by forms that are called Free File Fillable Forms. These forms support simple mathematical formulae and can’t be used for the more complicated state tax returns. There are some tax software companies that can provide you with support software that can be used to file state tax returns. These are also found in the Internal Revenue Service website www.irs.gov. and as such can be trusted with your tax information since they go through a verification process of sorts. You can also decide to handle the process yourself, especially if you have a working knowledge of how to file your taxes and the calculations involved. E-file software is commercially available and once you have processed the information, you can then send it through the secure channels available through the Internal Revenue Service website. Yet another method is to use a tax preparer. The law requires that these tax filing professionals be well-versed with the e-filing process and it also makes practical sense for them to be familiar with it. This will certainly help one enjoy the benefits of e-filing while also leaving the process in the hands of experienced professionals. The Internal Revenue Service provides you with various directions and steps that can help you select which form of electronic tax filing-works for you, making the process conveniently user-friendly. Investment Idea: $100 invested in collectible coins. Total Time Spent on Investment: I spent over an hour talking to the owner of a local collectible’s store, as well as some time running to the ATM to withdrawal cash for the investment. This investment was bought at the same time as my investment in Morgan Silver Peace Dollars, which you can read about here. Research and Preparation: As far as research goes, as a child I had been given mint sets of coins every year for Christmas by a family friend. I knew some coins were really collectible but I a lot weren’t, especially since most batches of mint coins were made in issues of millions making them worthless as far as rarity go, so a lot of the collectible coins value comes from the content of the coins i.e. what metal is in it. While I had stumbled into a collectible coin store in my town, I had offered a deal for four Morgan Stanley dollars for $25 (below their market price) but as a condition of the deal I would buy some other coins worth $100, so that way I would spend a total of $200 for two different investments. The owner of the store Howard, when I told him what I wanted to do selected a couple of combinations of coins for me to pick from to get the value of $100 I needed. He ended up putting in front of me a 1993 United States Silver Proof Coin Set. It was a pretty standard set of coins, containing a penny, a nickle, a half dollar, a quarter, and a dime. 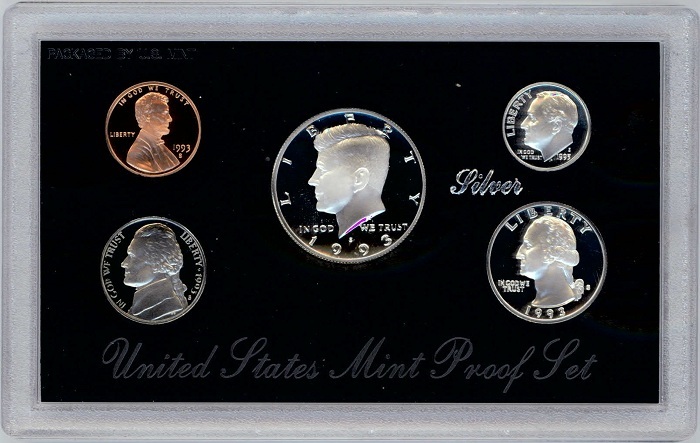 The special part of this set was the fact that the half dollar, quarter, and the dime were actually made of silver instead of their standard metals making them exceptionally shiny and worth more than a regular mint set. The whole set was then sealed in a case that comes in a box, see below. 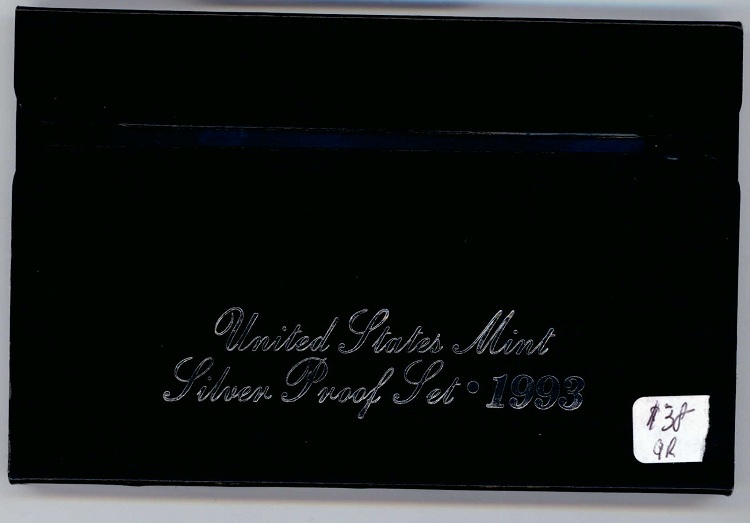 (1993 United States Silver Proof Coin Set Box)As you can see the price tag on the box was $38. Howard then showed me in a price guide for the coins how this price was actually on the more whole sale “dealer” price end of the price spectrum for this piece. 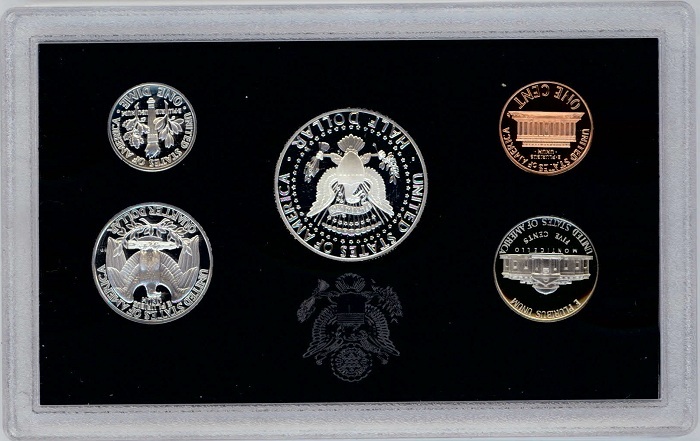 (Back of the 1993 United States Silver Proof Coin Set)Howard then also proceeded to take out a “graded” Morgan Silver Dollar coin from his case. I already was buying four Morgan dollars as an investment, but this one was different. 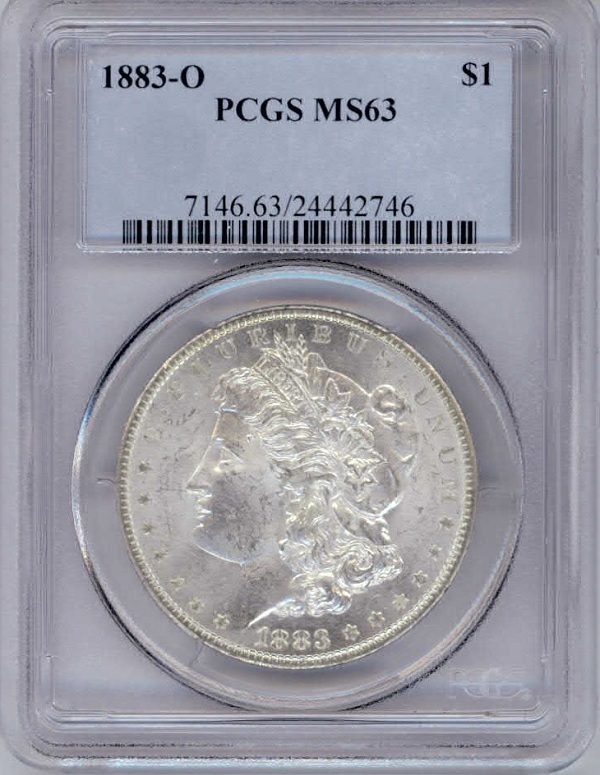 This was a graded uncirculated mint Morgan dollar. Uncirculated coins mean it was never used in my case Howard had taken out a graded 1883 Morgan Peace dollar. It had maintained an eerily perfect appearance even though it was over a hundred years old. The grading process costs about $15 per a coin, and makes the graded coins worth more than just the standard “melt” price I would get for my circulated Morgan peace dollars from my other coin investment. (Back of the Graded 1883 Morgan Peace Silver Dollar)The price tag for the graded 1883 Morgan Peace Dollar was $62. Add this to the $38 I would be paying for the silver coin set it would be come a perfectly round $100 price tag. As economic uncertainty continues and people flock to more physical investments the coin market has been booming. It is now a $5 Billion a year industry. Investment Idea: $100 invested in four Morgan Peace silver dollars. Total Time Spent on Investment: Around an hour spent in a coin store talking to the owner and then running to the ATM to withdraw money to purchase the coins. In the weak economy we now live and a world rife with struggle and uncertainty. Many people like to flock to investments that they they believe will hold value even if they economy and world at large falters. This has caused the price of both gold and silver to sky rocket over the past few years. I wanted in on this action as an investment to hedge against my more immaterial stock investments I had already made. (A very helpful text)Wow — this must have been a sign: a store had opened in my own town that claimed to sell gold, silver, and collectibles. A couple of weeks went by before I had enough time to actually stop in and visit the store but finally on a Saturday I went in. The store was unassuming and barren of any items except for three display cases near the back and behind that a desk with a man reclining in a chair. His name was Howard. I said hi to him and told him I lived in the town and ran a website called Alt Investments, where I made $100 investments, and that I would like to buy $100 worth of gold if possible. Howard was nice and understanding and I think was happy to see such a young person interested in something as boring as gold and silver collecting. He had just recently opened his store in my town but made the bulk of his money from going to coin shows instead so he wasn’t too bothered yet by the limited foot traffic. Over the next hour we talked about a lot of things: he discussed the importance of saving, how kids aren’t into it, how he had a plan to hand out little Indian pennies to all of the school children in town to get them interested, and perhaps get their parents to come to his store to buy more expensive items. He mentioned how he too lived at home until he was twenty five and instead of moving out into an apartment went right on to buying his first house, something I wish I could do one day also. This led us to an in-depth discussion of the housing bubble and why the prices should have dropped at some point. After talking for a while I broached the subject that I wanted $100 worth of gold, but unfortunately the smallest amount he could sell was a tiny speck of a coin, the size of a dime, and that was worth $250 on the spot price of gold, far outside of my $100 per investment cap. Howard also told me that the tax was a killer, since due to New York laws there is tax only on gold purchases of $1,000 or less. Meaning that the more gold bullion I bought the better off I would be. So with gold being out of the question I asked about the rest of his wares. The sparsely filled cases had rolls of silver coins and a couple of coins in protective plastic cases. The big coins were Morgan Peace Silver Dollars. Howard took a couple out and placed them on the counter in front of me. “This is a Morgan Peace dollar,” he said as he picked up one of the comically large coins. “They weigh 26.73 grams, and are made up of 90% silver and 10% copper.” Meaning 24.057 grams of silver. Since there are 31.10 grams in one troy ounce, that means that 24.057 grams of silver is equal to 77.345% of one ounce of silver. Take the price of an ounce of silver which on the day I went to Howard’s store was about $31.74 (August 31st 2012 closing price). So 77.345% of that is about $24.54. Each Morgan Peace Dollar had $24.54 worth of silver in it. Also, each Morgan Peace Dollar contains 10% of its weight as copper. For a total of 2.673 grams. Since copper is sold in pounds we need to multiply it by .00220462262 to convert grams to pounds. The price of a pound of copper on the day I went to the store was $3.47. Meaning the total amount of copper was worth $0.0205025. An almost unnoticeable amount. What is of note is that we had just calculated the MELT price. Which is the amount you could be paid based on the spot price of the metal in the coin if you melted the coin and sold the metal. Howard explained that most coin stores buy the coins at about $2 below melt, and then sell them for $3 or $4 above the melt price. Meaning the Morgan Dollars he had in his case he would sell to me for about $28 or $29 each, and would be them from me for about $23. While we continued to talk Howard gave me a quick history lesson on Morgan Peace Silver dollars. They were first minted back in 1878 and production continued 1904 and then they were on hiatus only coming back for one more year in 1921, to celebrate the end of World War I. 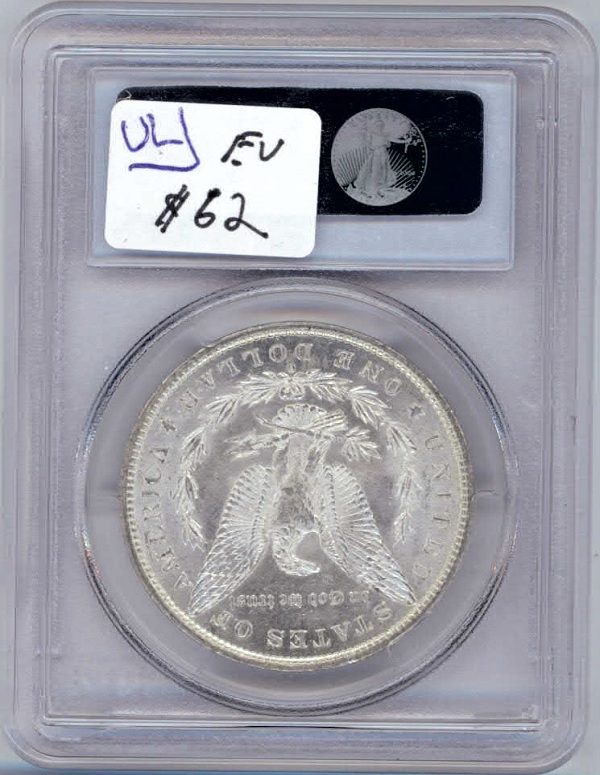 The rarest issue of the coins came from the 1895 Philadelphia issue, which only minted 880 coins. The design for the coins was by George T. Morgan, hence the name Morgan silver dollars. On the front of the coins is the phrase “E PLURBUS UNUM,” meaning “out of many, one.” This is a reference to the original states coming together to form one nation. This was especially important since the Civil War had only just ended in 1865, and a Congressional Act from February 12th 1873, had required all coins to contain the phrase. Also, the woman on the coin has a head band with the word “Liberty.” She also has cotton and grain stuck behind the head band, both of which reference the two cash crops of the North and the South respectively. What a lot of people may notice is the weird hat on top of the female’s head, this is actually a pileus. Or a symbol for Libertas, Latin for liberty. The pileus was a felt cap worn by freed Roman slaves. This too was a subtle reference to the just ended Civil War and the freeing of the slaves. After seeing the coins and holding the coins I wanted them. Unfortunately the retail price per a coin was $28, which would have made my total cost for four of them $112. However after talking to Howard for so long I got creative and offered him $200 for a total of two investments $100 for four of the Morgan dollars, and $100 for a coin set and a graded Morgan dollar. The other coins would become my investment in coins which you can read about here. Howard agreed to the deal even though he meant he was selling me the coins at his dealer price, he was happy to help me out and he even ate the tax on the deal, so the total cost to me for both investments was just under $200. So I ran to the closest ATM and withdrew $200 in cash to buy the coins. (Four Morgan dollars please)If you aren’t as lucky to have some one at the store cut you a great price try buying your coins from a coin show. Howard said the majority of his business happened there. Also, don’t ever buy online, as they will charge you such a high premium that it would be almost impossible for you to ever profit from the coins. 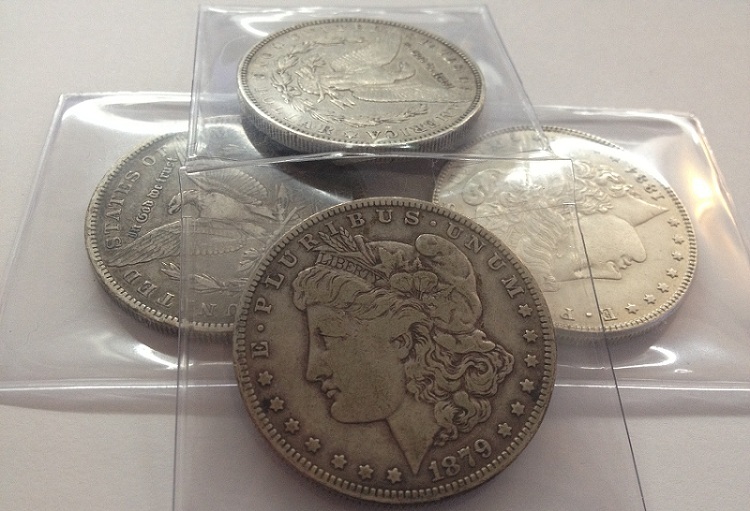 Below are closeups of the four Morgan peace silver dollars I purchased. Chock full of history and composed of 90% silver, the Morgan peace dollar has become a highly collectible and in recent years valuable coin. With the price of silver per an ounce sky rocketing from $6 per, to $30 today, it has provided a great return to those who have owned it during the past risky and uncertain years. And with the economy still uncertain I decided to buy some of my own. I was able to buy four of them for $100 or $25 each. Around the MELT price. This investment provides a good balance to my other stock investments, since even if the market tanks silver and other precious metals should continue to go up. The return on this investment is a bet that the economy stays bad, and people continue to flock to precious metals and other material investments. This investment is valued at the current melt price of a Morgan silver dollar multiplied by four, for the four silver dollars I own.